Spend all the time you can with them … camping … school events … holidays … and just because. … Just like your own children, your grandchildren will be grown up before you know it. “We do this by the way we look at them, talk to them and about them, as well as the way we act with them, and care about their futures. Being a grandma while liberating and totally amazing, is also a responsibility. Therefore, I am always on the hunt for how to be a “good” grandparent. Below are tips from some wonderful grandmothers that I know. SYMPATHETIC RESPONSE. I read once that a grandmother’s best response to anything that upsets the child is a sympatric “Awwww” as you cuddle the little one or hug the older child. I have used it so I don’t have to contradict parents or take sides, or try to fix what I cannot. Good for boo-boos, too. SUPPORT PARENTS WHILE TEACHING RESPECT. I believe that a grandma should be supportive of the parents’ wishes and dictates. At grandma’s you ask “May I please have that” and say “Thank you, grandma,” etc. It works where your “ways” differ from what’s going on at home. Grandma has to teach the children to respect her and her belongings. DISCIPLINE USING THE NAUGHTY CHAIR. We have a comfortable chair where a child is taken to sit until he/she decides to behave. “Time out” lasts until the child is ready to get off the chair and behave. So the child can sit there and pout or cry for as long as they want, but meanwhile they are seeing the rest of us carry on as usual. A TEEN GRAND CHILD ANSWERS. A good grandma . . .
Takes the place of your mom. Is someone you can always talk to & get advice from. Does everything within their means that the parent can’t do. Your Turn . . . What tip(s) do you have to share? . . . What tip(s) would you like to implement? Gee, what “G” word would you write about? I am linking this to ABC Wednesday. The ABC Wednesday Facebook Group is here. GRAND PARENTING BLOGS I READ . . .
POSTS I LIKE . . .
Children as well as adults can “hear” from God and benefit from it. Unfortunately, this is a topic I never brought up with my children. Because I never thought to do so. And Listen . . . God is speaking as well. Have you thought to teach your child the necessary skills and steps needed for this? What’s needed to hear God’s voice? Below are some ideas. ONE. Relationship with God. God wants to speak to His children. He wants them to know how to live wisely. He wants them to have a proper view of Him, themselves, and their circumstances. In order for your child to “hear” and even want to hear from God, s/he must have a personal relationship with God, in other words, to be born again. This post gives 3 Simple Words To Use When Explaining To Kids What It Means To Follow Jesus. TWO. Desire to hear from God. Talk with your kiddo about the benefits of hearing God’s voice. 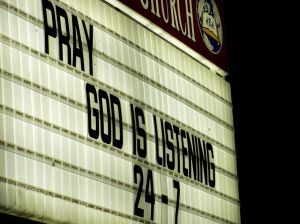 Tell him/her why you desire to hear from God. There are many “voices” in society from whom we can get answers and affirmation. There are many things that can distract and grab the attention of your child. For Believers, absolute truth comes from God. Therefore listening for His answers and affirmation is the best thing we can do. THREE. Knowledge that this is possible. Let your kiddo know that just as God hears them, s/he can hear from God. Go to this link to read verses about hearing from God. Now that s/he knows it is possible, have the child start listening. This post shares How to Hear God’s Voice. FOUR. Quiet place and thoughts. Your child lives in a noisy world. All types of gadgets vie for his/her attention and s/he most likely has one on a majority of the day. But in order to hear the quiet voice of God, quiet is needed. This is a great post that deals with this topic: Helping Kids Hear God’s Voice In The Quiet. FIVE. Read and Get to Know God’s Word. A majour way that God speaks to His Children is through His Word, the Bible. Teach your child how to have regular devotions and why they are important. This post shares 3 REASONS I Have a Regular Quiet Time (aka Devotions). Tell your child your 3 reasons. SIX. Practice and Patience. Hearing God’s voice is not usually something that happens without practice. As already mentioned, there are many voices in our world endeavoring to give us input. Therefore, it takes practice to be able to sort out which voice is God’s. And since this is something that will take some time to learn, tell your child that s/he will also need patience. Listen to this youtube video of Casting Crowns singing Voice of Truth. SEVEN. Model the behaviour for your child. “What we desire our children to become, we must endeavor to be before them,” (Andrew Combe). In this case, it is important that you “do” as you say. Read this post for some more thoughts on this: An Example for Others to Imitate. Parents, don’t be like me and neglect discussing this topic with your child. Knowing how to listen to God is a great aid in living according to His Word. And learning this young in life is something they will use until their last breath. What item from this list has been most effective for your child? Today’s letter is V. The topic is God’s VOICE. 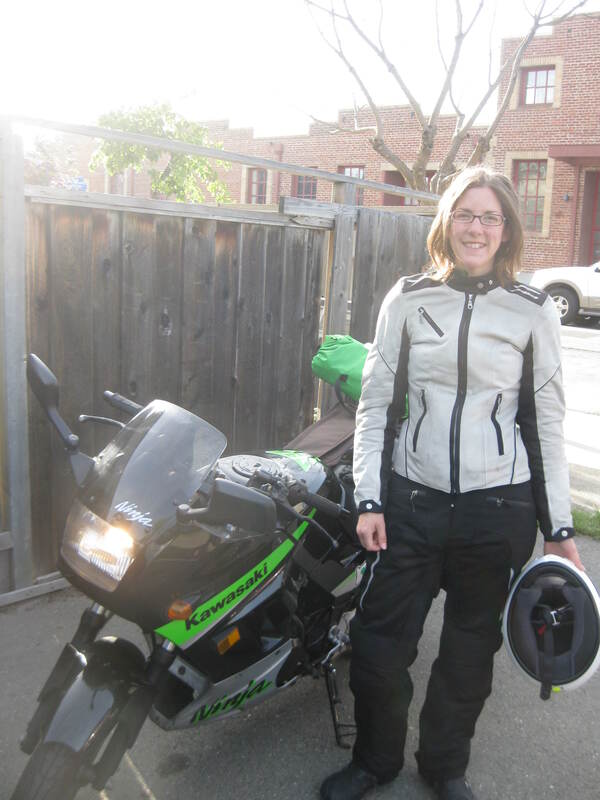 Elizabeth is all packed for her first motorcycle camping trip to Big Sur. These are the kinds of comments I get when folks learn that my 20-something daughter rides a motorcycle.Truthfully, I’m not usually afraid for her and I don’t tell her to stop. Elizabeth is a careful rider. She is hyper alert when riding. She doesn’t drink and drive. She has mitigated the risks by taking several riding classes. She always wears full gear. Always. I trust her. I trust God. If/when the bad happens, I will deal with it then, not before. That idea has been an anchor for 27 or so years when I first learned that my toddler son had sclerosis. This truth is similar to Scarlet O’Hara’s (Gone With the Wind) “I will think about it tomorrow” coping device. But there is a difference. The difference is God. I can and will deal will it (well) tomorrow because I know that God is with me. He will give me the grace and wisdom to handle any situation that comes into my life. I’ve seen this to be true in the hard times in my life: financial woes, illness, death, divorce, (to name a few situations). And yes, I’ve “seen” God in parenting challenges and scares as well. Parenting adult children is such a different task. My roles as guide and protector have slid from the forefront to the background. I think one of the best ways I can now parent Elizabeth is by trusting her, supporting her, and of course, praying for her. I can choose to worry about the possible bad and nag. Or I can choose to trust, refresh my mind with the good, and praise my daughter. I choose to trust. I choose the good. I choose to praise. In short, I choose God’s way. In full disclosure, I am not perfect in this. There have been times I fretted, said the wrong things, and haven’t trusted my daughter and/or God. Your Turn . . . What have you learned about parenting (well) an adult child? Today’s letter is M. The topic is about MOTORCYCLES and parenting.